If you liked Anna’s balloon mobile #001, you may also like this. 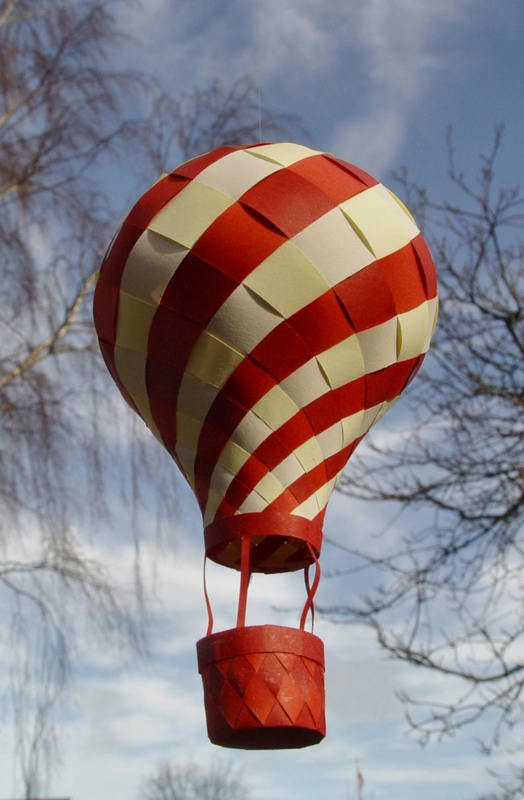 Anna has designed a somewhat larger and more detailed Balloon #002. For each balloon cut four sheets in the colours you like. Because of the size of the balloon you have to glue stick each arm individually to the small disk as explained for Sphere #001. When doing so you have the chance of planning the pattern. If you want the colours to swivel use two alternating colours on the same disk. If you want a chequered pattern use only one colour but different on each disk. 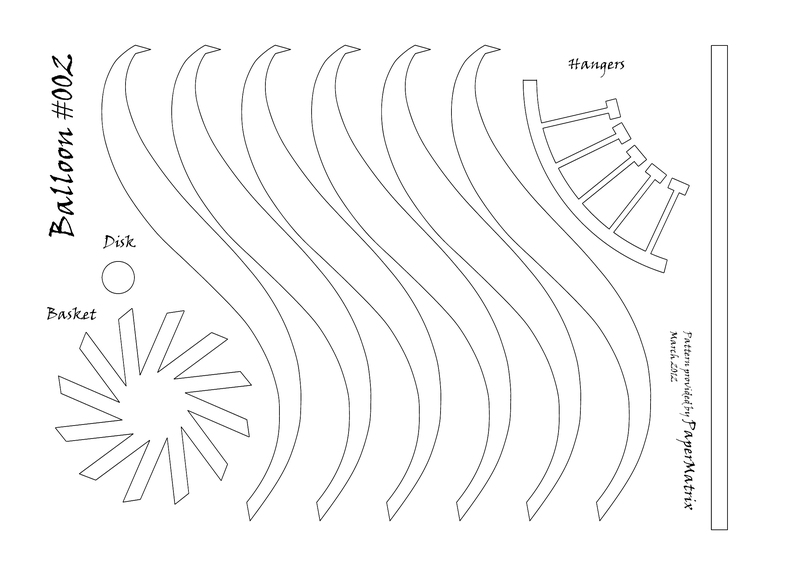 Weave as explained for Sphere #001. Finishing is much easier. Fix each arm with a little glue at the lower edge and the balloon is ready. Select a ‘hanger’ piece in the colour you like best. Smear glue on one side of the top and wrap it around the lower edge of the balloon. The hangers must come down. Choose two of the ‘basket’ pieces, fold back each arm, put one piece above the other and weave. The basket is rather small and you may like to fix the weaving with a little glue as you go along. Also fix the basket with glue at the top edge. Take the balloon and fix the five hangers on the outer side of the basket using the rectangles. Try to make them equally long and as straight as possible. Then smear glue on one side of one of the strips in the colour of your choice and wrap it around the basked covering the base of the hangers. Finally make a small hole in the centre disk at the top of the balloon and fix a piece of string using a small pearl or like inside the balloon. We plan to make a video within the next weeks. We never did this before so it will probably take some time. Did you ever make a video for this pattern if so where can I find it? These hot air balloons are so cute. These ones are much bigger than the previous one. Found it pretty difficult but I’ll try to make more of these to practice. Thank you very much!